This section presents ePrep News up to 2011. The latest news item is at the top of the list. To be informed of ePrep activities since 2012, please visit the Web page SILLAGES News (in French). This page presents 2010-2011 ePrep News. To have access to the 2009 News, please click here. To have access to the 2007-2008 News, please click here. Since 2010, ePrep has successfully organised the launch of the SILLAGES initiative for the development of two flagship ePrep projects in an operational way: the SILLAGES Platform and the SILLAGES Wiki. Today, ePrep is a member of the SILLAGES.info Association, with Conférence des grandes écoles, Ecole Polytechnique ParisTech, EDHEC, ESSEC and UNISCIEL, and will be involved in the development of the SILLAGES initiative for the next period. The members of the ePrep community are invited to join the SILLAGES community, becoming SILLAGES actors or on the SILLAGES social networks: Twitter, LinkedIn and YouTube. Internet users will be kept informed of these developments on the SILLAGES Website. On October 19, 2011, at the Délégation générale of the Conférence des grandes écoles, in Paris, the SILLAGES.info Association has been launched. Status have been signed by the Conférence des grandes écoles, Ecole Polytechnique ParisTech, EDHEC, ePrep, ESSEC and UNISCIEL. The object of the association is to develop the SILLAGES.info initiative. Read the press release (in French). On October 20, the 2011 ePrep - SILLAGES Day brought together 61 participants from 9 countries at Ecole polytechnique (Palaiseau, France). In the morning, the 2011 ePrep International Thematic Seminar was organised on the theme "Innovative projects for international cooperation", In the afternoon, the 2011 SILLAGES Event was organised on the theme "SILLAGES resources and community: results and prospects". Proceedings, including the synthesis of the day, all communications to be downloaded as pdf files, the videos filmed by Canalc2.tv, are available on this Web site. The 2011 SILLAGES award ceremony took place during the closing session of the 2011 SILLAGES Event organised on the occasion of the 2011 ePrep - SILLAGES Day at Ecole polytechnique, on October 20. The list of the prizewinners, in English, Business, Greek and Literature, Latin, Mathematics, Physics, and the video of the Award ceremony are available on this Web site. The 10th ePrep anniversary was celebrated during the closing session of the 2011 ePrep Seminar organised on the occasion of the 2011 ePrep - SILLAGES Day at Ecole polytechnique, on October 20. All participants were given a retrospective brochure and were invited to a cocktail. 64 new resources have been uploaded on the SILLAGES Platform and 11 new articles have been edited on the SILLAGES Wiki in response to the Call for contributions open on the occasion of the award ceremony organised on October 2011 at the Ecole polytechnique (Palaiseau, France), in the framework of the 2011 ePrep - SILLAGES Day. 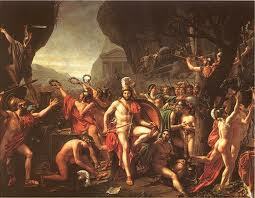 Domains of these resources are Business, English, Greek, Latin, Literature, Mathematics and Physics. In consequence, 28 new scientific resources will be indexed by UNISCIEL in the framework of its cooperation with ePrep. 2011 ePrep - SILLAGES Day: register now ! On October 20, exactly in four weeks, the actors of ICT for enhancing international and social access to the "Grandes écoles" will bring together at Ecole polytechnique, amphithéâtre Becquerel, on the occasion of the 2011 ePrep - SILLAGES Day. This event is announced on the Ecole polytechnique Website. The 17th edition of the Online Educa Berlin Conference and Exhibition, set to be the key event for the international technology-supported learning and training actors, will be held in Berlin (Germany), from November 30 to December 2. On the theme "New Learning Cultures", Online Educa Berlin 2011 will secure an excellent line-up of top international experts, who will cover a range of key topics, bringing together their knowledge and experience from various backgrounds. As a partner of this event, ePrep can provide its members with special prices. The SILLAGES Community of Practice, launched on July 8, 2011, which gathers to date 31 members from eight countries (Cambodia, Canada, Côte d'Ivoire, France, Switzerland, Tunisia) has startded its collaborative work through discussions in the two forums opened on the SILLAGES Platform (section Divers / Travail collaboratif), one being devoted to inernational aspects and the other one to social ones. This work should lead to better suit Platform and Wiki resources to users' needs, and to eventually propose set of resources customized for different types of users. The brand new SILLAGES Community of Practice is launched in continuation with the ePrep Community of Practice, for the production of free digital resources aiming at enhancing social and international access to the "grandes écoles". This new community also includes students using the SILLAGES resources and members of organisations ready to help these students in this use. A detailed presentation of this new community is made on the sillages.info Web site. The programme of the 2011 ePrep - SILLAGES Day to be held on October 20, at Ecole polytechnique, is now available online. In the morning, it will be the 2011 ePrep International Seminar, on the theme "Innovative projects for international cooperation", and in the afternoon, it will be the 2011 SILLAGES Event, on the theme "SILLAGES resources and community: results and prospects". The ePrep Seminar closing session will celebrate the 10th ePrep anniversary, and the SILLAGES Event closing session will celebrate the winners of the 2011 SILLAGES awards. Registration is free but compulsory, detailed information available on this Web site. To participate in the 2011 SILLAGES awards, authors are invited to visit the SILLAGES Website giving all detailed information. They can send their contribution to the SILLAGES Platform and/or to the SILLAGES Wiki until September 20, 2011. The award ceremony will take place on the occasion of the 2011 ePrep - SILLAGES Day, on October 20, 2011, at Ecole polytechnique. ePrep was invited to present the SILLAGES initiative on the occasion of the bimontlhy meeting of the Social Access Group of the Conférence des grandes écoles which held on May 17, 2011, at MINES ParisTech (Paris). 80 participants attended this meeting. An account of this event is available on this Web site (in French). The exploratory projects of the ePrep CoP have been developing according to two axis: the international cooperation between establishments, and the pedagogical innovation. An important update of the presentation of the ePrep CoP and of its activities has been made on this Website in order to highlight new developments performed. Conducted by two ePrep CoP members, Michèle TILLARD, CPGE teacher in Latin and Greek, and Patrick VOISIN, CPGE teacher in Literature and Latin, these developments aim at encouraging other teachers for sharing their experiences in the field of technology enhanced learning. A detailed account is proposed here (in French). Conducted from April 13 to April 15, 2011, by two ePrep CoP members, Olivier GRANIER and Marwan BROUCHE, both CPGE teachers in Physics, this cooperation aimed at presenting to Lebanese students the French exams for entering Grandes écoles. A detailed account is proposed here (in French). The 4th francophone Workshop focussing computer sciences training and didactics, DIDAPRO 4 - Dida&STIC, will be held at University of Patras (Greece), from October 24 to 26, 2011, according to 4 themes : (1) Computer sciences training (2) Computer sciences, a real discipline ? (3) ICT sciences training for teachers (4) Digital resources for ICT sciences training. ePrep, supporting this event, encourages its members for participating and for answering the call for contributions open until May 31. The meeting "Prepared to the Internet?" is organised by the Société européenne de l'Internet and Forum Atena at Mines ParisTech (Paris), on October 6, 2011. ePrep, a partner of this event, encourages its members for participating. In the framework of the coordination of the SILLAGES initiative, ePrep organised two meetings, the SILLAGES Project Team meeting and the SILLAGES Editorial Committee meeting, on April 14, 2011, at Mines ParisTech, in Paris. These meetings allowed to define the main axis of development of the SILLAGES initiative and to precise the organisation of the 2011 ePrep - SILLAGES day. ePrep had a mission in Cambodia aiming at reinforcing the cooperation in the framework of the SILLAGES initiative with the Institute of Technology of Cambodia (ITC) and its partners, Agence universitaire de la Francophonie (AUF) and Ecole polytechnique. A detailed account of this mission is proposed here (in French). The patronage ceremony of SILLAGES, initiative developed under the guidance of Ecole polytechnique / ParisTech, ESSEC and ePrep, by M. Yazid SABEG, Commissariat à la diversité et à l'égalité des chances, which held on March 24, 2011, in Paris, is retransmitted in video on the SILLAGES Web site (in French). This year again, ePrep supports the CICERO European Competition by organising preliminary online meetings with FlashMeeting, the online meeting application developed by the Open University, an ePrep partner. For its fifth edition, the CICERO Competition, managed by Patrick Voisin, Teacher in Litterature and Latin at Lycée Barthou (Pau, France) will gather in March and April the latinists through three continents : Europe, Africa and Australia. On March 24, 15:00 - 16:00, at the Délégation générale of the Conférence des grandes écoles, in Paris, Commissaire Yazid Sabeg will confirm the patronage by the Commissariat à la diversité et à l'égalité des chances of the SILLAGES initiative developed by Ecole polytechnique / ParisTech, ESSEC and ePrep for enhancing international and social access to the Grandes écoles. Read the press release (in French). The SILLAGES initiative, developed under the guidance of Ecole polytechnique / ParisTech, ESSEC, and ePrep, is proud to be under the patronage of the Commissariat à la diversité et à l'égalité des chances. The Commissaire Yazid SABEG has announced this patronage in a document dated February 4, and given Christian MARGARIA, Conseiller Formation et enseignement supérieur, the responsibility to follow up the programme. The 2011 ePrep International Thematic Seminar, on the theme "Innovative projects for international cooperation", and the 2011 SILLAGES Event, including the 2011 SILLAGES awards, will be held on October 20, at Ecole polytechnique, Palaiseau (France). The registration is free and has to be done online. Detailed information available on this Web site. ePrep participated in the UNISCIEL Days, on January 18-19, 2011, at UPMC, Paris, including the communications of the French Ministry for Education, of UNISCIEL, of UPMC, of ePrep, and the presentation of the UNISCIEL Call 2010 projects. An account of this event is available on this Web site (in French). In charge of the coordination of the SILLAGES initiative, ePrep organised on January 20, in Paris, a meeting aiming at reinforcing the SILLAGES Project Team and aiming at proposing partnerships to institutions, in order to insure the developments planned for 2011.
ePrep has published the synthesis of its 2010 activities: watch activities, SILLAGES initiative, development of the ePrep CoP and of its projects, organisation of the fifth ePrep International Thematic Seminar, management of the ePrep Web site and ePrep Web groups... 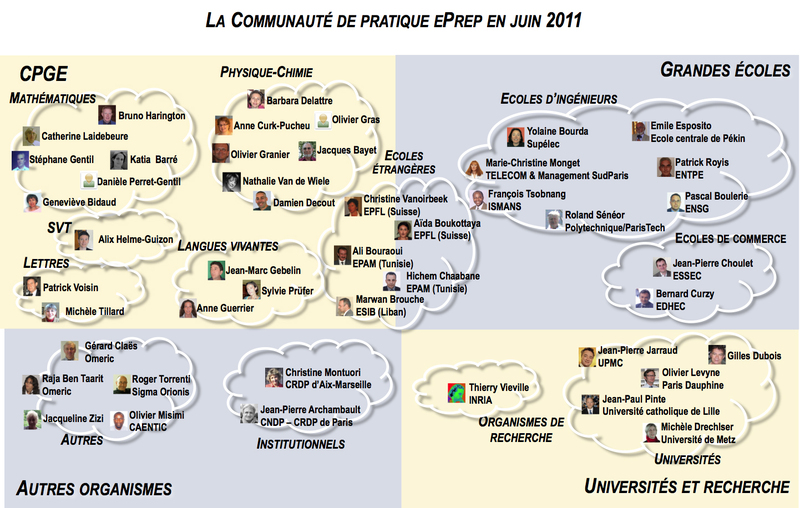 The synthesis of the 2010 ePrep activities is available here (in French). Thanks to the cooperation between UNISCIEL and ePrep, the scientific resources available through the ePrep Web site are indexed by UNISCIEL according to the SupLOMFR standard to be brought in its data base (UNISCIEL Newsletter n°2, December 15, 2010). Monique Vindevoghel, General Secretary of UNISCIEL, participated in a round table of the 2010 ePrep International Thematic Seminar organised on November 17, 2010 at the Senat. Nathalie Van de Wiele, Director of ePrep, is invited to make a communication in the framework of the UNISCIEL Days, January 18 & 19, 2011. The "Séminaire national des lettres" organised by the French Ministry for Education, on the theme "Metamorphosis of the book and of the lecture bring by the computer age", brought together 600 participants and more than 120 speakers, from November 22 to November 24, in Paris. An account of this event is available on this Web site (in French). The 2010 ePrep Seminar (Palais du Luxembourg, November 17, 2010) attained one's objective: to think about the concept of Sustainable Education and to illustrate this concept in our institutions and abroad. This 9th ePrep event, which brought together 89 participants of 8 countries (Cambodia, Canada, Côte d'Ivoire, France, Lebanon, Senegal, Switzerland, Tunisia), was also the occasion to officially launch the SILLAGES initiative. The 2010 SILLAGES award ceremony took place during the closing session: twelve authors, in economics, literature and sciences, were given a medal of the French Senate. The proceedings, including the address of the President of the Conférence des grandes écoles, the synthesis of the seminar and the communications of speakers are already online. ePrep is preparing its next Seminar on Twitter, LinkedIn and YouTube. - On Twitter, you can use the hashtag #eprep2010 for being informed of all information about this event. - On LinkedIn, you can join the ePrep Group to discuss about the topic Sustainable Education. 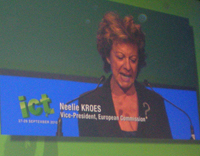 - On YouTube, the ePrepVideos Channel has suscribed to the Paradiso (FP7 European Project) Channel and has announced on this Channel, at ICT 2010, that Sustainable Education was a part of the Future Internet. 48 new resources have been uploaded on the SILLAGES Platform and 43 new articles have been edited on the SILLAGES Wiki in response to the Call for contributions open on the occasion of the award ceremony organised on November 2010 at the Sénat, in Paris, in the framework of the 2010 ePrep International Thematic Seminar. Domains of these resources are Mathematics, Physics, Economics and Latin. In consequence, 32 new scientific resources have been indexed by UNISCIEL in the framework of its cooperation with ePrep. The Europe' s biggest research event for information and communication technologies, ICT 2010, held from September 27 to 29 in Bruxelles, on the occasion of the launching of the 2011-2012 ICT Work Programme of the 7th Framework Programme for Research and Technology development (FP7). ePrep attended the event and propose an account (in French). A new ePrep Group on LinkedIn ! Social networks are a real opportunity for creating, discovering and sharing ideas with others. ePrep, already connected to Twitter and YouTube, now develops its network on LinkedIn. If you want to participate in discussions on the theme of Information and communication technologies for enhancing international and social access to the "grandes écoles", join the ePrep LinkedIn Group ! The 2010 ePrep Seminar, on the theme "Sustainable Education" (Sénat, Paris, November 17), will be the occasion of the official launch of the SILLAGES initiative (Resources for enhancing SocIaL and internationaL Access to the "Grandes EcoleS") jointly developed by Ecole Polytechnique / ParisTech, ESSEC and ePrep. All detailed information (programme, objectives, call for contributions, registration and access), including a first list of participants, are online. ePrep is involved in the development of the of the SILLAGES initiative (Resources for enhancing SocIaL and internationaL Access to the "Grandes EcoleS"), with Ecole Polytechnique / ParisTech and ESSEC. A new ePrep Web page presents all actions conducted by ePrep in this framework. The SILLAGES Editorial Committee, formed by ePrep, one of the SILLAGES partners with Ecole polytechnique / ParisTech and ESSEC, counts representatives of France and of seven French-speaking countries: Cambodia (ITC), Canada (Teluq), Côte d'Ivoire (INP-HB), Lebanon (ESIB), Senegal (ESMT), Switzerland (EPFL) and Tunisia (EPAM). The SILLAGES Website is online ! The SILLAGES Website - Resources for enhancing SocIaI and International Access to the "Grandes EcoleS" - having Ecole polytechnique / ParisTech, ESSEC and ePrep for partners is online. The SILLAGES initiative will be officially launched at the French Senate, on November 17, 2001, in the framework of the ePrep Seminar on the theme "Sustainable Education". The Francophone Platform is renamed the SILLAGES Platform and the Wikiprépas Website is renamed the SILLAGES Wiki. A Call for contributions is open for the two Websites untill September 15, 2010. An award ceremony will take place for the best contributions during the closing session of the Seminar. An Editorial Committee is set up for developing the Francophone Platform and Wikiprépas, two projects for enhancing international and social access to the "Grandes écoles", under the guidance of Ecole polytechnique / ParisTech, ESSEC and ePrep. This committee, chaired by the General Delegate of the Conférence des grandes écoles, gathers representatives from "Classes préparatoires", "Grandes écoles", universities, research institutes, institutional organisations and other organisations, from France and French-speaking countries. To date, this Committee counts 26 members. The 16th edition of the Online Educa Berlin Conference and Exhibition, set to be the key event for the international technology-supported learning and training actors, will be held in Berlin (Germany), from December 1 to 3. On the theme "Learning for all", Online Educa Berlin 2010 will secure an excellent line-up of top international experts, who will cover a range of key topics, bringing together their knowledge and experience from various backgrounds. As a partner of this event, ePrep can provide its members with special prices. The 2010 ePrep International Seminar, on the theme "Sustainable Education", will be held at the Sénat, Paris, on November 17, 2010. This seminar, organised by ePrep with the support of the Conférence des grandes écoles and INRIA, will include the official launch of the Francophone Platform and of Wikiprépas, two projects jointly developed by Ecole polytechnique / ParisTech, ESSEC and ePrep. The programme of the seminar and a registration form are available online. On April 21, 2010, Monique Vindevoghel, General Secretary of UNISCIEL, the Online Thematic University for sciences, and Nathalie Van de Wiele, director of ePrep, initiative launched in 2001 for enhancing international and social access to the "grandes écoles" by the use of ICTEs (Information and communication technologies for education), announce the cooperation of the two organisations for a better access to their online resources. Thanks to the both parts, the scientific resources available on the Francophone platform (project launched in 2006 by ePrep and now developed in association with Ecole polytechnique / ParisTech, ESSEC and ePrep) are indexed by UNISCIEL according to the SupLOMFR standard to be brought in its data base. Up to date, the whole collection of courses and exercises available on the Francophone platform (88 courses et 47 series of exercises) are already accessible via UNISCIEL. Monique Vindevoghel and Nathalie Van de Wiele are happy with this interesting cooperation for a free access to scientific resources in respect with standards. In the framework of the 15th Rencontres de l'Orme, Orme 2.10, ePrep attended two sessions on March 31, the first one about computer sciences programmes for high schools, the second one about the place of ICTEs (information and communication technologies for education) in the new high schools programmes. An account of these events is available on this Web site (in French). The 2010 ePrep International thematic Seminar, on the theme "Sustainable Education", will be held at Sénat, on November 17, 2010. This siminar will include the official launch of two projects jointly developed by Ecole Polytechnique / ParisTech, ESSEC and ePrep: the Francophone platform and Wikiprépas. Detailed information available on this Web site. In the framework of a cooperation with Unisciel, the indexation of the Francophone platform resources, according to the LOMFR / SupLOMFR standard common to the French Digital thematic universities, has been decided. Thanks to this cooperation, the Francophone platform resources will be soon available through Unisciel. On the occasion of an ePrep CoP meeting, it has been decided that the Francophone platform (hosted by ParisTech) and the Wikiprépas Web site (hosted by ESSEC), two projects developed successfully by ePrep CoP members in an exploratory way, will be now developed in an operational way, under the guidance of Ecole Polytechnique / ParisTech, ESSEC and ePrep. In this framework, a first Editorial Committee has been created. In its December edition, the Qualitique magazine, "The managerial culture of the XXI century, Business ethics", has published an article about ePrep. Entitled "ePrep, a Community of practice for ICT", this four page article has been presented in the section Formation and Gestion of Competencies of the magazine. Read the article (in French).